Back in the 1980’s there were three notable animated movies that hit the theaters. Well, actually two of them as the movie we’re talking about now, ROCK & RULE never had a real American theatrical run. Reportedly the American distributor, MGM, really didn’t care for the movie at all and had zero interest in any kind of promotion for it. They had it badly recut and some voices re-dubbed, threw it into theaters for about a minute and that was it. 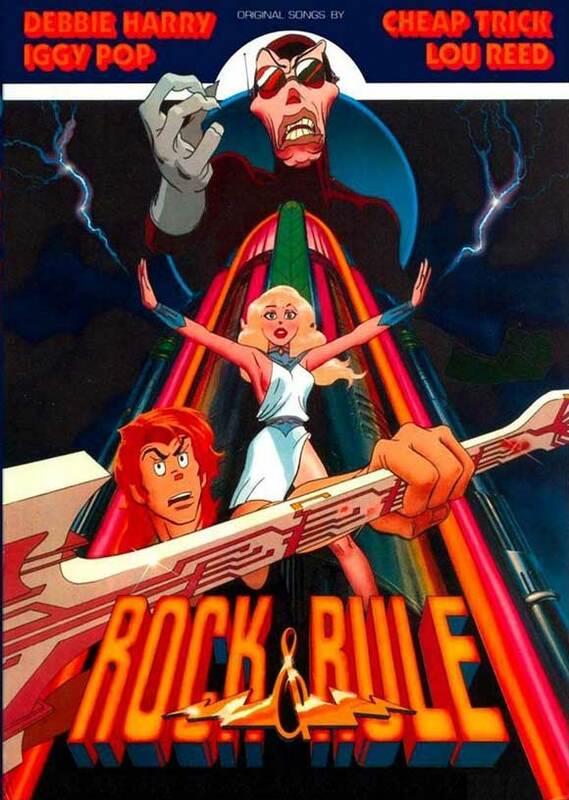 Most people like me saw ROCK & RULE either on HBO or Showtime which usually ran it late night on Fridays and Saturdays. But what ROCK & RULE had in common with “American Pop” and “Heavy Metal” was the heavy marketing of their soundtracks. In fact, the rock soundtracks of “Heavy Metal” and ROCK & RULE was blatantly the selling point of both of those movies and not the story. But it’s not hard to see why. ROCK & RULE features the vocal talents of and songs by Cheap Trick, Debbie Harry, Lou Reed, Iggy Pop and Earth, Wind & Fire so why not use them to sell your movie? I watched the Canadian version on YouTube which Wikipedia tells me has a completely different opening narration from the American version. The Canadian narration neglects to inform viewers that there was a nuclear holocaust and now the world is inhabited by mutated humanoid dogs, cats and rats. Which isn’t a good thing because 90% of the cast goes through the movies either with no noses at all or they’re shaped like bananas so if you have no knowledge of how this world got this way, you’re liable to watch the movie wondering what’s wrong with everybody’s noses. And actually there’s really no good reason I could see for the filmmakers to throw that in as all the characters act like humans and display none of the characteristics of the animals they’re supposed to be mutated from. Except for Mylar (Martin Lavut) the sleazy owner of a bar who is quite obviously a rat. Mok (Don Francks/ singing voice by Lou Reed & Iggy Pop) is the last great mega-star rock and roller in the world. Mok’s overwhelming artistic desire is to craft a final performance that will make his career immortal. To accomplish this he has created The Armageddon Key, a musical incantation disguised as a song that will open a portal to another dimension and allow a nightmarish demon of staggering power entry to Earth. The last thing Mok needs is a very special voice to sing his apocalyptic song. Mok is certainly more enjoyable to watch than the guy who we’re supposed to root for, Omar. He’s a spoiled man-child who is solely motivated to go to Nuke Yawk not to save Angel from Mok’s dastardly clutches but because he’s pissed off that Mok wants to make Angel a star and not him. Omar’s sidekicks, Dizzy and Stretch are boring characters who contribute nothing to the story except tired comedy relief but they’re not as bad as Mok’s trio of roller-skating goons, the Schlepper Brothers who are nowhere near as funny as the filmmakers obviously thought they were. I wish I could say that the movie has a kickass soundtrack to make up for its shortcomings but outside of Lou Reed’s “My Name Is Mok” Debbie Harry’s “Angel’s Song” and Earth, Wind & Fire’s “Dance Dance Dance” there aren’t any other songs I can say I enjoyed or found worthy of toe-tapping. The animation itself is quite good and easy on the eye. 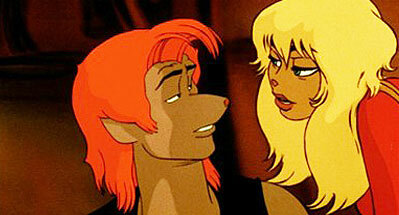 It’s very much like Ralph Bakshi’s style of animation. 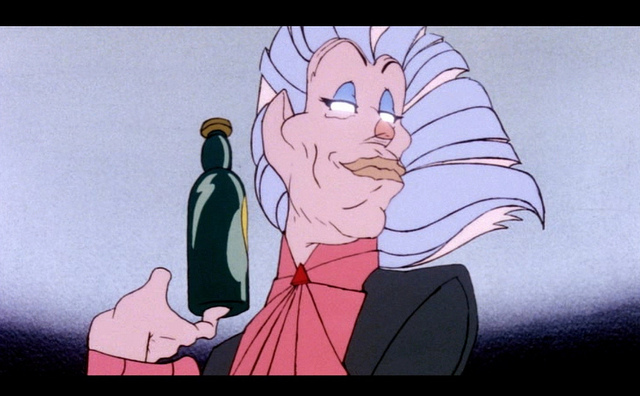 In fact, the movie looks so much like a Bakshi movie that supposedly there were bootleg VHS tapes sold at comic book conventions that did have Ralph Bakshi named as director. So should you see ROCK & RULE? If you’re an animation fan I would say so. ROCK & RULE has attained a legendary status due to its troubled production history and it becoming a cult movie thanks to HBO and Showtime. It’s nowhere near the masterpiece that some people I know claim it is but neither is it a movie that deserved the throwaway treatment it received from MGM. It is available on DVD and a Blu-Ray edition was released in 2010. The Canadian version used to be available on YouTube. I don’t know if it’s still up but it’s worth the search. Enjoy.